"Kramnik" redirects here. For the Polish village, see Kramnik, Poland. This name uses Eastern Slavic naming customs; the patronymic is Borisovich and the family name is Kramnik. Vladimir Borisovich Kramnik (Russian: Влади́мир Бори́сович Кра́мник; born 25 June 1975) is a Russian chess grandmaster. He was the Classical World Chess Champion from 2000 to 2006, and the undisputed World Chess Champion from 2006 to 2007. He has won three team gold medals and three individual medals at Chess Olympiads. In 2000, Kramnik defeated Garry Kasparov and became the Classical World Chess Champion. He defended his title in 2004 against Péter Lékó, and defeated the reigning FIDE World Champion Veselin Topalov in a unification match in 2006. As a result, Kramnik became the first undisputed World Champion, holding both the FIDE and Classical titles, since Kasparov split from FIDE in 1993. In 2007, Kramnik lost the title to Viswanathan Anand, who won the World Chess Championship 2007 tournament ahead of Kramnik. He challenged Anand at the World Chess Championship 2008 to regain his title, but lost. Nonetheless, he remained a top player; he reached a peak rating of 2817 in October 2016, which makes him the joint-eighth highest-rated player of all time. Kramnik publicly announced his retirement as a professional chess player in January 2019. He stated he intends to focus on projects relating to chess for children and education. Vladimir Kramnik was born in the town of Tuapse, on the shores of the Black Sea. His father's birth name was Boris Sokolov, but he took his stepfather's surname when his mother (Vladimir's grandmother) remarried. As a child, Vladimir Kramnik studied in the chess school established by Mikhail Botvinnik. His first notable result in a major tournament was his gold medal win as first reserve for the Russian team in the 1992 Chess Olympiad in Manila. His selection for the team caused some controversy in Russia at the time, as he was only a Fide master. However, his selection was supported by Garry Kasparov. He scored eight wins, one draw, and no losses, a performance of 2958, which won a gold medal for best rating performance. The following year, Kramnik played in the very strong tournament in Linares. He finished fifth, beating the then world number three, Vassily Ivanchuk, along the way. He followed this up with a string of good results, but had to wait until 1995 for his first major tournament win at normal time controls, when he won the strong Dortmund tournament, finishing it unbeaten. In 1995, Kramnik served as a second for Kasparov in the Classical World Chess Championship 1995 match against challenger Viswanathan Anand. Kasparov won the match 10½–7½. In January 1996, Kramnik became the world number-one rated player; although having the same FIDE rating as Kasparov (2775), Kramnik became number one by having played more games during the rating period in question. This was the first time since December 1985 that Kasparov was not world number one, and Kramnik's six month stretch (January through June 1996) as world number one would be the only time from January 1986 through March 2006 where Kasparov was not world number one. By becoming number one, Kramnik became the youngest ever to reach world number one, breaking Kasparov's record; this record would stand for 14 years until being broken by Magnus Carlsen in January 2010. Kramnik continued to produce good results, including winning at Dortmund (outright or tied) ten times from 1995 to 2011. He is the second of only nine chess players to have reached a rating of 2800 (the first being Kasparov). During his reign as world champion, Kramnik never regained the world number-one ranking, doing so only in January 2008 after he had lost the title to Viswanathan Anand; as in 1996, Kramnik had the same FIDE rating as Anand (2799) but became number one due to more games played within the rating period. Kramnik's 12 years between world number-one rankings is the longest since the inception of the FIDE ranking system in 1971 (disputed with Fischer "frozen" rating). In the mid- and late-90s, Kramnik, although considered one of the strongest players in the world, suffered several setbacks in his attempts to qualify for a World Championship match. In 1994, he lost a quarterfinal candidates match for the PCA championship to Gata Kamsky 1½–4½, and later that year, lost a semifinal candidates match for the FIDE championship to Boris Gelfand with the score 3½–4½. In 1998, Kramnik faced Alexei Shirov in a Candidates match for the right to play Garry Kasparov for the Classical World Chess Championship, and lost 3½–5½. In 1999, Kramnik participated in the FIDE knockout championship in Las Vegas, and lost in the quarterfinals to Michael Adams 2–4. Suitable sponsorship was not found for a Kasparov–Shirov match, and it never took place. In 2000, sponsorship was secured for a Kasparov–Kramnik match instead. This was somewhat controversial, making Kramnik the first player since 1935 to play a world championship match without qualifying. In 2000, Kramnik played a sixteen-game match against Garry Kasparov in London, for the Classical Chess World Championship. Kramnik began the match as underdog, but his adoption of the Berlin Defence to Kasparov's Ruy Lopez opening was very effective. With the white pieces, Kramnik pressed Kasparov hard, winning Games Two and Ten and overlooking winning continuations in Games Four and Six. Kasparov put up little fight thereafter, agreeing to short draws with the white pieces in Games 9 and 13. Kramnik won the match 8½–6½ without losing a game (this was only the second time in history that a World Champion had lost a match without winning a single game). This event marked the first time Kasparov had been beaten in a World Championship match. Kramnik's performance won him the Chess Oscar for 2000; this was the first time he had received the award. In October 2002, Kramnik competed in Brains in Bahrain, an eight-game match against the chess computer Deep Fritz in Bahrain. Kramnik started well, taking a 3–1 lead after four games. However, in game five, Kramnik made what was described as the worst blunder of his career, losing a knight in a position which was probably drawn. He quickly resigned. He also resigned game six after making a speculative sacrifice, although subsequent analysis showed that he had drawing chances in the final position. The last two games were drawn, and the match ended tied at 4–4. In February 2004 Kramnik won the Tournament of Linares outright for the first time (he had tied for first with Kasparov in 2000), finishing undefeated with a +2 score, ahead of Garry Kasparov, the world's highest-rated player at the time. From 25 September 2004 until 18 October 2004, Kramnik retained his title as Classical World Chess Champion against challenger Péter Lékó at Brissago, Switzerland, by barely drawing the match in the last game. The 14-game match was poised in favor of Lékó right up until Kramnik won the final game, thus forcing a 7–7 draw and ensuring that Kramnik remained world champion. The prize fund was 1 million Swiss francs, which was about USD $770,000 at the time. Because of the drawn result, the prize was split between the two players. When Garry Kasparov broke with FIDE, the federation governing professional chess, to play the 1993 World Championship with Nigel Short, he created a rift in the chess world. In response, FIDE sanctioned a match between Anatoly Karpov and Jan Timman for the FIDE World Championship, which Karpov won. Subsequently, the chess world had seen two "champions": the "classical" championship, claiming lineage dating back to Steinitz; and the FIDE endorsed champion. When Kramnik defeated Kasparov and inherited Kasparov's title, he also inherited some controversies. Because the arrangements for the Kasparov–Shirov match fell through, (it appears Shirov refused to play for what he considered too small a prize fund) Kasparov decided to try to arrange a match with the highest rated player according to FIDE's rating list. At the time Anand was the highest rated player but Anand refused the match. In the meantime Kramnik overtook Anand in rating and so he was offered the match. Kramnik accepted and ended up playing the match despite his loss of the qualifying match against Alexei Shirov in 1998. At the next FIDE world championship (FIDE World Chess Championship 2005), Kramnik refused to participate, but indicated his willingness to play a match against the winner to unify the world championship. After the tournament, negotiations began for a reunification match between Kramnik and the new FIDE World Champion—Veselin Topalov of Bulgaria. In April 2006, FIDE announced a reunification match between Kramnik and Topalov—the FIDE World Chess Championship 2006. The match took place in Elista, Kalmykia. After the first four games, Kramnik led 3–1 (out of a maximum of 12). After the fourth game, however, Topalov's coach/manager Silvio Danailov protested that Kramnik was using the toilet suspiciously frequently, implying that he was somehow receiving outside assistance whilst doing so. Topalov said that he would refuse to shake hands with Kramnik in the remaining games. The Appeals committee decided that the players' toilets be locked and that they be forced to use a shared toilet, accompanied by an assistant arbiter. Kramnik refused to play the fifth game unless the original conditions agreed for the match were adhered to. As a result, the point was awarded to Topalov, reducing Kramnik's lead to 3–2. Kramnik stated that the appeals committee was biased and demanded that it be replaced. As a condition to continue the match, Kramnik insisted on playing the remaining games under the original conditions of the match contract, which allows use of the bathroom at the players' discretion. The controversy resulted in a heavy volume of correspondence to Chessbase and other publications. The balance of views from fans was in support of Kramnik. Prominent figures in the chess world, such as John Nunn, Yasser Seirawan, and Bessel Kok also sided with Kramnik. The Russian and Bulgarian Chess Federations supported their respective players. After twelve regular games the match was tied 6–6, although Kramnik continued to dispute the result of the unplayed fifth game until the end of the match. On 13 October 2006 the result of this disputed game became irrelevant as Kramnik won the rapid tie-break by a score of 2½–1½. Kramnik's victory helped him win the Chess Oscar for 2006, the second of his career. When Kramnik won the 2006 unification match, he also won Topalov's berth in the 2007 World Championship as the incumbent FIDE champion. Although the rationale behind his (and Garry Kasparov's) "classical" title is that the title should change hands by challenge match rather than by tournament, Kramnik stated that he would recognize the winner of this tournament as being the world champion. In the tournament, held in September 2007, Kramnik and Anand drew both of their games but Kramnik finished second. The tournament, and the world championship, was won by Viswanathan Anand. Pursuant to the agreement reached before the 2007 tournament Kramnik and Anand played a match of the World Championship title in 2008 in Bonn. He fell victim to Anand's superior preparation, and lost three of the first six games (two with the white pieces). Kramnik's play gradually improved, and although he managed a 29 move victory in game 10, he did not win any other game, and lost the match to Anand by a score of 6½ to 4½ (three wins to Anand, one win to Kramnik, seven draws). Kramnik had exceptionally good results in 2009, winning once again in Dortmund and then winning the Category 21 (average Elo = 2763) Tal Memorial in Moscow with 6/9 and a 2883 rating performance ahead of world champion Anand, Vassily Ivanchuk, Magnus Carlsen, Levon Aronian, Boris Gelfand, former FIDE world champion Ruslan Ponomariov, Peter Leko, Peter Svidler and Alexander Morozevich. At the time, the average Elo rating of the field made it the strongest tournament in history. Following this result, Kramnik stated that his goal was to regain the World Championship title. He also participated in the London Chess Classic in December, finishing second to Magnus Carlsen, losing their head-to-head encounter on the Black side of the English Opening. Kramnik's performance in 2009 allowed his rating (average of July 2009 and January 2010 ratings) to be high enough to qualify for the Candidates Tournament to determine the challenger for the World Chess Championship 2012. Kramnik began 2010 at the Corus chess tournament in the Netherlands, during which he defeated new world number one Carlsen with the Black pieces in their head-to-head encounter, ending Carlsen's 36-match unbeaten streak. A late loss to Viswanathan Anand knocked him out of first place, and Kramnik finished with 8/13, tying for second place with Alexei Shirov behind Carlsen's 8½ points. In May 2010 it was revealed that Kramnik had aided Viswanathan Anand in preparation for the World Chess Championship 2010 against challenger Veselin Topalov. Anand won the match 6½–5½ to retain the title. In April–May 2010 he tied for 1st–3rd with Shakhriyar Mamedyarov and Gata Kamsky in the President's Cup in Baku and won the event on tie-break after all finished on 5/7. Kramnik also participated in Dortmund, but had a subpar showing, losing to eventual champion Ruslan Ponomariov and finishing in joint third place with 5/10. He then participated in the Grand Slam Chess Masters preliminary tournament in Shanghai from 3 to 8 September, where he faced world number four Levon Aronian, Alexei Shirov, and Wang Hao; the top two scorers qualified for the Grand Slam final supertournament from 9 to 15 October in Bilbao against Carlsen and Anand. Scoring 3/6, Kramnik tied for second place with Aronian behind the winner Shirov's 4½/6. In the blitz playoff, Kramnik defeated Aronian to qualify along with Shirov for the Grand Slam final. Shortly after qualifying for the last stage of the Grand Slam, Kramnik played on board one for the Russian team in the 2010 Olympiad. He scored +2–0=7. Following the Olympiad, Kramnik participated in the Grand Slam Chess Masters final in Bilbao where he competed against Anand, Carlsen and Shirov. The average rating of the field was 2789, the highest in history. After defeating world number one Carlsen for the second consecutive time, and then Shirov in his first two games, Kramnik drew his final four games to finish in clear first with 4/6. This gave Kramnik the distinction of having won the two strongest tournaments in chess history. Kramnik's attempt to defend his 2009 title at the Tal Memorial in Moscow ended with a 7th place, while he finished 5th in the London Chess Classic in England. 2011 brought varied results. In Wijk aan Zee Kramnik shared fifth with Maxime Vachier-Lagrave, and in the Candidates he was eliminated by Alexander Grischuk. He won Dortmund for the tenth time, with Lê Quang Liêm in second place, and shared third behind Peter Svidler and Alexander Morozevich in the Russian Superfinal. Kramnik won the third London Chess Classic with four wins and four draws, and a rating performance over 2900 Elo. Hikaru Nakamura came second. However, in the earlier 6th Tal Memorial 2011 Moscow he came 8th out of 10, with 2 losses (to Nepomniachtchi and Svidler) and 7 draws, with Magnus Carlsen winning the overall tournament on tiebreak from Levon Aronian. Kramnik played a friendly match against Levon Aronian, which finished 3–3 (with a win for Aronian in a rapid game that didn't count as tiebreak). In Tal Memorial he shared fourth place behind Magnus Carlsen, Fabiano Caruana and Teimour Radjabov. He finished second in the London Chess Classic behind Carlsen. Kramnik played in the 2013 Candidates Tournament, which took place in London, from 15 March to 1 April. He finished with +4−1=9, sharing the first place with Magnus Carlsen, who won due to having better tiebreaks. In the 2013 Alekhine Memorial tournament, held from 20 April to 1 May, Kramnik finished seventh, with +2−2=5. In the 2013 Tal Memorial tournament, held from 13 to 23 June, Kramnik finished tenth out of ten, with +0−3=6. In the Chess World Cup 2013, held in Norway from 11 August to 2 September, Kramnik finished in first place, defeating Dmitry Andreikin in the four-game final match 2½–1½. Kramnik did not succeed in defending his title in the Chess World Cup. In the third round he was defeated by Andreikin. He participated as one of 130 grandmasters at the combined World Rapid and Blitz Championships in Berlin that was organized by FIDE from 10 to 14 October. In the World Rapid Championship he remained unbeaten, winning five games of 15 and reaching the 6th place. Kramnik finished third in the World Blitz Championship in Berlin with 15 / 21. He was a half-point behind the winner Alexander Grischuk and lost second place on tiebreak to Maxime Vachier-Lagrave. Kramnik competed in the Dortmund Sparkassen Chess Meeting, held from 9 – 17 July and finished joint second with 4/7. He played in the Tal Memorial (a ten-player round-robin tournament) in Moscow from 26 September – 6 October. He finished sixth with 4.5/9 in the opening blitz round-robin on 25 September, meaning that he was given one more game to play with the black pieces than with the white in the classical tournament. He finished joint fifth in the classical tournament, again with 4.5/9. He participated in three of the four events of the Grand Chess Tour (he withdrew from the Sinquefield Cup due to health issues and was replaced by Svidler): Kramnik played the Paris Grand Chess Tour speed chess tournament, the Your Next Move Grand Chess Tour speed chess tournament, and the London Chess Classic classical chess tournament. All the events of the Grand Chess Tour were 10-player round robin tournaments. The Paris Grand Chess Tour tournament was held from 9 – 12 June and was composed of a mixture of rapid and blitz games. Kramnik finished ninth with 5.5/18, above only comparatively low-rated wildcard player Laurent Fressinet. The Your Next Move Grand Chess Tour tournament was held from 17 – 20 June in Leuven, Belgium. Like the Paris GCT, it was composed of a combination of rapid and blitz games. Kramnik finished joint eighth with 2.5/9. The London Chess Classic was held from 9 – 18 December. Kramnik finished joint third with 5/9. Kramnik competed in the 81st Tata Steel Chess Tournament in January, where he finished last with a score of 4½/13 (+2–6=5). He subsequently announced his retirement from professional chess: "I already decided to finish my professional chess career a couple of months ago and now, after having played my last tournament, I would like to announce it publicly." He said he might still participate in rapid and blitz events and hold simultaneous exhibitions. He stated that he intends to focus on chess for children and education. Kramnik played a six-game match against the computer program Deep Fritz in Bonn, Germany from 25 November to 5 December 2006, losing 2–4 to the machine, with 2 losses and 4 draws. He received 500,000 Euros for playing and would have twice as much had he won the match. Deep Fritz version 10 ran on a computer containing two Intel Core 2 Duo CPUs. Kramnik received a copy of the program in mid-October for testing, but the final version included an updated opening book. Except for limited updates to the opening book, the program was not allowed to be changed during the course of the match. The endgame tablebases used by the program were restricted to five pieces even though a complete six-piece tablebase was widely available. The first game ended in a draw. A number of commentators claimed that Kramnik missed a win. The second game was won by Deep Fritz, due to a mistake by Kramnik, who failed to defend against a threatened mate-in-one. Susan Polgar called it the "blunder of the century". The third, fourth and fifth games of the match ended in draws. In the last game Kramnik played the aggressive Sicilian Defense in an attempt to win with black and hence even the match, but was outplayed by Fritz. Kramnik was forced to resign, and Fritz won the match 4–2. 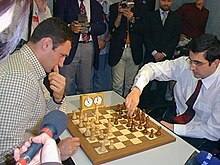 Vladimir Kramnik (right) playing chess with Vitali Klitschko, Dortmund, 2002. On 30 December 2006 Kramnik married French journalist Marie-Laure Germon. Their wedding took place in the Alexander Nevsky Cathedral in Paris. They have two children: daughter Daria, and son Vadim Vladimirovich. Kramnik has been diagnosed with ankylosing spondylitis, an uncommon form of arthritis. It causes him great physical discomfort while playing. In January 2006, Kramnik announced that he would skip the Corus Chess Tournament in Wijk aan Zee to seek out treatment for his arthritis. He returned from treatment in June 2006, playing in the 37th Chess Olympiad. He scored a +4 result, achieving the highest rating performance (2847) of the 1307 participating players. PCA Quarterfinals, June 1994, New York, Kramnik–Gata Kamsky (1½–4½). FIDE Semifinals, August 1994 Sanghi Nagar, Kramnik–Boris Gelfand (3½–4½). Classical WCC Candidates Match, 1998, Cazorla, Kramnik–Alexei Shirov (3½–5½). FIDE WCC Knockout Quarterfinals, July 1999, Las Vegas, Kramnik–Michael Adams (2–4, including rapid playoff). Classical World Chess Championship 2004, Brissago, Kramnik–Péter Lékó (7–7), Kramnik retains. FIDE World Chess Championship 2007 Runner up, Mexico City (loses the title to Anand, joint second Gelfand). World Chess Championship 2013 Runner-up, Candidates Tournament, March–April 2013, London, +4−1=9. He failed to qualify for the Candidates Tournament 2016, after narrowly missing a qualifying place on rating, and being eliminated in the third round of the Chess World Cup 2015. He qualified for the Candidates Tournament 2018 as the organiser's nominee, placing fifth with +3−4=7. Garry Kasparov described Kramnik's style as pragmatic and tenacious, in the latter similar to Anatoly Karpov. He is one of the toughest opponents to defeat, losing only one game in over one hundred games leading up to his match with Kasparov, including eighty consecutive games without loss. Kasparov did not defeat Kramnik during their 2000 World Championship match, partly due to Kramnik's use of the Berlin Defence of the Ruy Lopez. Kramnik is renowned for his endgame skills. Kramnik has significantly shaped opening theory in chess. Viswanathan Anand has said of him in 2012: "I don't know exactly how many lines he's established, but you get the impression that for the last 10 years we've only been using his ideas. ... His stamp on opening theory is much more significant than mine." Kramnik's results with the white pieces against the King's Indian Defence made Kasparov drop the opening from his repertoire, and caused the opening to disappear from top-level play for many years. Kramnik's use of the Berlin Defence in his 2000 match against Kasparov led to a massive increase in the opening's popularity. Kramnik also revived the Catalan Opening. Vladimir Kramnik (1994). Mikhail Tal I-III (2017 Games) 3 Chess Books. Chess Stars. S.W. Gordon, T. Taylor (1994). Young Lions: Vladimir Kramnik. 3 Girls Publishing. Eduard E. Gufeld (1994). Führende Schachmeister der Gegenwart Wladimir Kramnik. Rochade Europa. Vladimir Kramnik, Mark Dvoretsky; et al. (1996). Positional Play. Batsford Ltd. ISBN 978-0-7134-7879-2. Vladimir Kramnik, Iakov Damsky (2000). My Life and Games. Everyman Chess. ISBN 978-1-85744-270-0. Vladimir Kramnik; et al. (2000). Proryv. ISBN 978-5-7846-0032-5. Evgeny Bareev, Ilya Levitov (2007). From London to Elista: The Inside Story of the World Chess Championship Matches that Vladimir Kramnik Won Against Garry Kasparov, Peter Leko, and Veselin Topalov. New In Chess. ISBN 978-9056912192. D. Barlov, P. Ostojic (2006). Vladimir Kramnik. Chess Emperors. Igor Sukhin, Vladimir Kramnik (2007). Chess Gems: 1,000 Combinations You Should Know. Mongoose Press. ISBN 978-0-9791482-5-5. Daniel Lovas (2007). Vladmir Kramnik (The Chess Greats of the World). Caissa Chess Books. ISBN 963-87141-5-8. Alexander Kalinin (2011). Vladimir Kramnik. Great Chess Combinations. Russian Chess House. ISBN 978-5-94693-171-7. Richard Forster, Vladimir Kramnik (2011). The Zurich Chess Club, 1809–2009. McFarland & Co Inc. ISBN 978-0-7864-6064-9. Cyrus Lakdawala (2012). Kramnik: Move by Move. Everyman Chess. ISBN 978-1-85744-991-4. Official website: illustrated biography, classical game records (1987‒2013), and interviews (2011‒13). No content from after 2013. ^ "FIDE Rating List :: January 1996". OlimpBase. ^ "Men's Chess Olympiads: Vladimir Kramnik". OlimpBase. Retrieved 1 January 2012. ^ "Anand Beats Aronian in First Round Candidates' Tournament - ChessVibes". Archived from the original on 14 March 2014. Retrieved 13 March 2014. ^ Vladimir Kramnik and Iakov Damsky, Kramnik: My Life and Games (London: Everyman Chess, 2000), pp. 21–22. ^ "Classical World Chess Championship 2004". Archived from the original on 23 September 2004. Retrieved 14 October 2006. ^ a b "Vladimir Kramnik: "Kasparov Was Blaming Me for Following the Conditions of the Contract That Was Put Together by Him"". chess-news.ru. 16 October 2011. Retrieved 7 December 2013. ^ "Kasparov-Kramnik World Championship Match (2000)". Chessgames.com. Retrieved 7 December 2013. ^ "ChessBase.com – Chess News – World Championship Crisis – what our readers think". Chessbase.com. Retrieved 4 November 2008. ^ "ChessBase.com – Chess News – Bessel Kok on the World Championship crisis". Chessbase.com. Retrieved 4 November 2008. ^ "ChessBase.com – Chess News – John Nunn: 'It's about imposing your will on the opponent'". Chessbase.com. Retrieved 4 November 2008. ^ "ChessBase.com – Chess News – Seirawan: highly-charged situation calls for a compromise". Chessbase.com. Retrieved 4 November 2008. ^ "ChessBase.com – Chess News – Elista 2006: Match to continue with game six". Chessbase.com. Retrieved 4 November 2008. ^ Valaker, Ole (26 January 2010). "Så tapte Magnus" (in Norwegian). Nettavisen. Retrieved 31 January 2010. ^ Crowther, Mark (3 May 2010). "The Week in Chess: President's Cup Baku 2010". Chess.co.uk. Archived from the original on 23 July 2012. Retrieved 17 December 2011. ^ "The Week in Chess: Dortmund 2010". Archived from the original on 20 October 2011. ^ "Final Chess Masters 2010 in Shanghai and Bilbao". 2 August 2010. ^ Crowther, Mark (8 September 2010). "Shanghai Masters 2010". The Week in Chess. Retrieved 2016-05-12. ^ Ramírez, Alejandro (1 April 2013). "Candidates R14 – leaders lose, Carlsen qualifies". ChessBase News. Retrieved 6 April 2013. ^ "Tal Final: Gelfand wins, Carlsen clear second". Chessbase News. 23 June 2013. Retrieved 25 June 2013. ^ Doggers, Peter (2 September 2013). "Kramnik wins Tromsø World Cup". ChessVibes. Archived from the original on 4 September 2013. Retrieved 2 September 2013. ^ "Dortmund Sparkassen Chess Meeting". Chess24. Retrieved 19 December 2016. ^ "Tournament Standings - Dortmund Tournament". Chessgames. Retrieved 19 December 2016. ^ "Tal Memorial Blitz won by Mamedyarov". ChessBase. ^ "Tournament Standings - Tal Memorial (Blitz) Tournament". Chessgames.com. ^ "Tournament Standings - Tal Memorial Tournament". Chessgames.com. ^ "Vladimir Kramnik withdraws from Sinquefield Cup". ChessBase (mostly repeating a press release by the Chess Club and Scholastic Center of Saint Louis). 29 July 2016. Retrieved 19 December 2016. In a recent field change, GM Vladimir Kramnik regretfully withdrew from the Sinquefield Cup due to health issues. The CCSCSL invited fellow Russian, GM Peter Svidler to replace Kramnik as the 10th participant in the tournament. ^ "2016 Paris GCT". Grand Chess Tour. Retrieved 19 December 2016. ^ "Tournament Standings - Grand Chess Tour Paris Blitz Tournament". Chessgames.com. Retrieved 19 December 2016. ^ "2016 Your Move - Standings & Results". Retrieved 19 December 2016. ^ "8th London Chess Classic preview". Chess24. 7 December 2016. Retrieved 19 December 2016. ^ "Tournament Standings - London Chess Classic Tournament". Chessgames.com. Retrieved 19 December 2016. ^ "Vladimir Kramnik announces end of chess career". Tata Steel Chess Tournament. 29 January 2019. Retrieved 29 January 2019. ^ "Seirawan on Kramnik vs Deep Fritz game one". 27 November 2006. ^ "Blunder of the century? Biggest blunder ever?". Archived from the original on 22 March 2015. ^ "Vadim Vladimirovich Kramnik Has Born". chess-news.ru. 1 February 2013. Retrieved 14 February 2014. ^ "ChessBase.com – Chess News – Kramnik drops out of Wijk Super-Tournament". Chessbase.com. Retrieved 4 November 2008. ^ "Caruana beats Grischuk to win the Candidates and qualify to play Carlsen". The Week in Chess. 27 March 2018. Retrieved 30 December 2018. ^ Garry Kasparov, My Great Predecessors, vol 1 (London: Everyman, 2003), p. 9. ^ Raymond Keene and Don Morris, The Brain Games World Chess Championship (London: Everman Chess, 2000), p. 42. ^ Bob Ciaffone, "World Championship Chess Match," Michigan Chess Magazine (2001) http://www.michess.org/webzine_200102/worldchampionship.shtml Archived 29 September 2007 at the Wayback Machine. ^ Byrne, Robert (3 September 2006). "Kramnik Can Win an Endgame With Only the Slightest Edge" – via NYTimes.com. ^ "Log in or Subscribe – ChessCafe.com" (PDF). ^ "Kramnik: Move by Move - Products". New In Chess. 26 November 2009. Archived from the original on 23 October 2013. Retrieved 21 October 2013. ^ "Kramnik wins and is now in sole third place". Chessdom. 24 March 2013. Retrieved 21 October 2013. ^ "Dortmund 2012 – Kramnik shocks Gustafsson with a KID ... as black!". ChessBase.com. 14 July 2012. Retrieved 2 January 2013. ^ "Radjabov – Carlsen". Chessdom. 16 April 2008. Retrieved 2 January 2013. ^ "Dortmund Rd 7: Kramnik misses his chance". WhyChess. Archived from the original on 22 March 2013. Retrieved 10 February 2013. Wikimedia Commons has media related to Vladimir Kramnik.